So I was out at a friends house over the weekend and he was dying for some good ol’ BBQ Chicken so I figured I’d hook him up. The problem is that I totally left the house without my Big Butz BBQ sauce so I had to improvise and to my surprise everything turned out fantastic. I ran up to the grocery store around the corner and picked up boneless skinless chicken breasts and a few odds and ends. I figured I was ready until I walked up to the isle of BBQ sauce and knew that I had to make a decision. I couldn’t get the thought of using Big Butz Original on this chicken but certainly was not going to drive the 15 miles back to the house so I felt a little stuck. 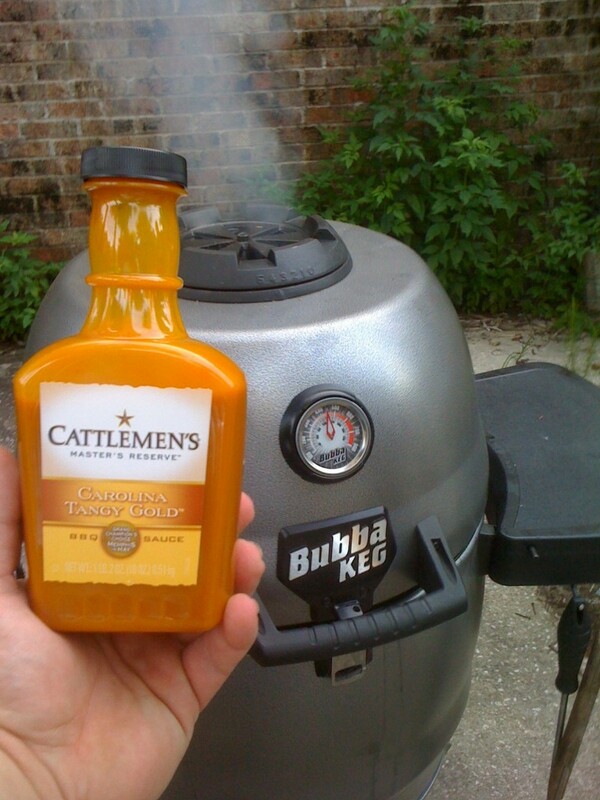 I figured I would take a change and grabbed a bottle of Cattlemen’s Carolina Tangy Gold sauce and would just use that. 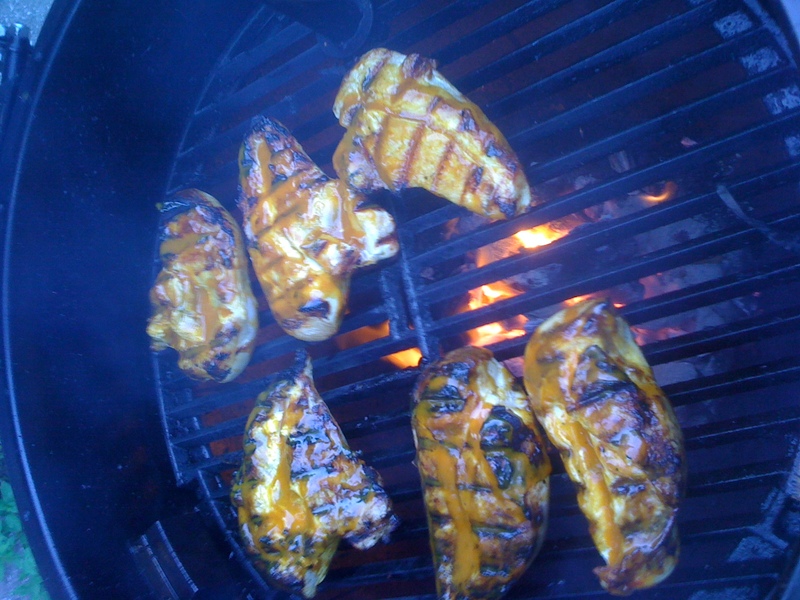 Now, I’m big on basting my Chicken with BBQ sauce and have found that most mustard based sauces seem to do much better since there is usually a little less sugar in the sauce. And this is definitely a mustard based sauce for the ages. As soon as we got back I went ahead an got the Bubba Keg fired up. Um, yeah, we drive around town with the thing because you never know when it’s going to be needed. Dropped in a couple of handfulls of lump coal, got my firestarter in and got it lit. Now it’s time to just prep the chicken. 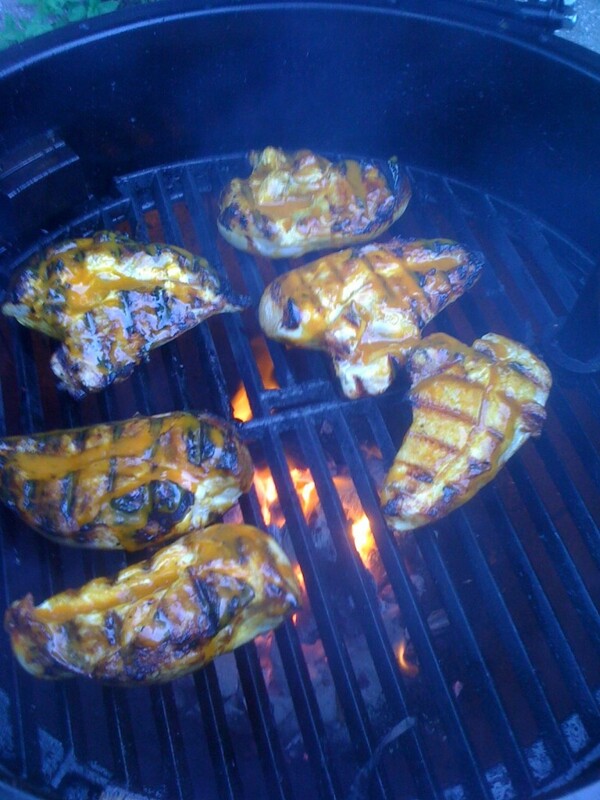 I decided to go basic and just added a little garlic salt and black pepper to the chicken and put it on the grill. I got the chicken started and started brushin’ the breasts down with the Cattlemen’s. Start, brush, cook, flip, brush, cook, I actually turned the chicken every couple of minutes to just make sure that I had plenty of sauce on the chicken. Well, I’m here to say that I was pleasantly surprised as to how fantastic the chicken turned out. The sauce didn’t burn but did help lock in all of the juices in the chicken. Every bite was super juicy and tender yet bursting with flavor. I definitely recommend trying out the Cattleman’s Carolina Tangy Gold if you get a chance, I can promise that it works perfect with chicken. Keep an eye out because I think I will be using this sauce again real soon…. After I run out of Big Butz.